YES, I COULD "make do" with something else (so, no, I don't need any suggestions of alternatives), but I would LOVE to have the ORIGINAL thing. COMMON: roughly 11/16" o.d. (with a crosshatch pattern on the outside edge) probably used on MOST of the tubas, and (probably) on the baritone horns as well. I managed to locate 6 of the RARE-LARGER ones for my Buescher C helicon project. I used 5 of them on that instrument (one on each piston, and one for the rotor lever's button) and I have one "spare". I would LIKE to have at least THREE MORE of the 13/16" diameter ones (SEVEN would be AMAZING) for one-or-both of my upcoming Buescher C TUBA projects. 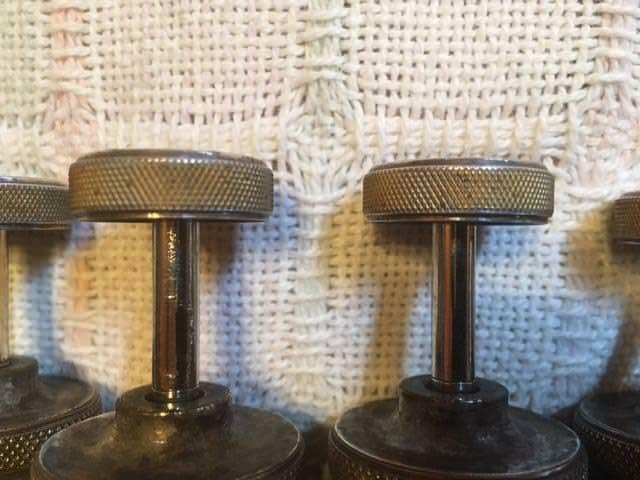 Though the threads were larger (probably 8-32 threads on these Buescher buttons, vs. a smaller thread on vintage Conn) these buttons feature a "riser" underneath which defacto adds length to the valve stems. With generic buttons (no riser), there is only a scant amount of room for a bumper washer (only about 1.7mm thick ) underneath the fingerbutton. YES, of course I could drill a piece of brass rod thread it on the inside, cut it off very short, and screw it down to the underside surface of "generic" finger buttons, but (again) I'd really like to have some ORIGINAL style buttons for one or both of these instruments. Again, I have ONE large 13/16" diameter (rare) button, and FOUR smaller (more commonly encountered) 11/16" diameter button...for two sets (for stems per set). 2/ in the large diameter. I might consider buying four of the small/more common 11/16" diameter ones (and would be grateful for someone to offer a few of those to me for sale), but I would pay MORE for the more rare 13/16" diameter ones. The threads are not the same as Conn 6̶-̶4̶0̶, but are LARGER 8-32 threads. ...but (again) I would really enjoy owning the genuine more-rare 13/16" diameter Buescher buttons. ...so does anyone else have one or two that they would be willing to sell?